This well written study on the formation of Roman towns in northern Marche, is crucial for our understanding of the colonisation and rule by Rome of the so-called ager Gallicus, between the conquest in 295 BC and the reign of Augustus. As I have underlined in a recent volume that approaches the same subject for the somewhat wider central Adriatic region of Italy (F. Vermeulen, From the Mountains to the Sea. 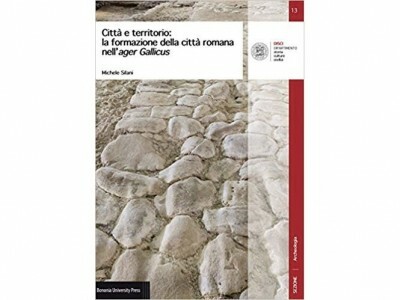 The Roman Colonisation and Urbanisation of Central Adriatic Italy, 2017) the book by Silani is a successful attempt to describe and analyse the formation and growth of towns in this still somewhat under-studied area of central Italy. The young scholar contributes significantly to a better understanding of the lasting Roman impact on conquered societies in this area south of the fertile Po plain, squeezed between the Apennines, the Adriatic and the area of the focal maritime harbour of Ancona. The first phase of Romanisation especially, coinciding with the later centuries of the Republic (third to first centuries BC), and culminating in the reign of Augustus, is essential to deciphering forms of transmission, assimilation and cultural integration. This phase is marked in this region by an impressive influx of colonists from other Italian regions and beyond, and by the introduction of urban ways of life modelled on Rome and central Tyrrhenian Italy. But it is also in these three first centuries of Roman dominance that a diversity of interesting urban forms was created, by a heterogeneous group of indigenous populations (e.g. Umbrians, Picenes) and immigrated groups (e.g. Celts, Etruscans) who deeply integrated their new habitation centres in the gradually changing surrounding territories and landscapes moulded by Latins and Romans. The book approaches the important subject of early urbanism and centralized settlement dynamics with a well-balanced and integrated historical-archaeological methodology, using all necessary and available sources and deepening the subject in an adequate way. It is well-structured and subdivided in three main parts. All parts are adequately illustrated with many new and much needed B/W and colour maps and plans, and the layout and structure of the volume allow for easy consultation of the bibliographically rich text parts. In part 1, the whole historical context and wider developments of the region between the end of the 4th century BC and Augustus are being discussed, with a detailed reconstruction of historical and military events and a state of the art of current research on a set of well-chosen sub-themes regarding the conquest and organisation of the land by Rome. The original starting point chosen by the author is that the urbanisation process in the region is not just a Roman “sudden event” limited to the walled town product, but a gradually prepared evolution rooted partly in native societies and visible in a more and more centralized organisation of the territory. The latter is being predominantly fed by a demographically important inflow of immigrants from Rome and Tyrrhenian central Italy who bring with them their know how, ideas and logistical power. Impressive and sometimes very disrupting transformations are visible in town planning, housing, settlement dynamics, the structuring of landscape forms, production and economic changes, which were all drastically enhanced in the ager Gallicus as a result of a real demographic colonisation of former Celtic and western Umbrian society. This first part offers the reader a scientifically stimulating presentation of the many different and often opposing viewpoints by the main authors on the subject, with a sometimes courageous but well-argumented choice of which of these viewpoints is to be preferred and needs subsequently to be used as “building block” in the author’s further discussion of the data. Silani stresses especially the instruments of the conquest and the specifically Roman models and mechanisms, and one wonders why certain (indeed ill-documented) indigenous forms of occupation were not more inserted in the discussion. In the specific case of the ager Gallicus this is explained by the historical data that suggest a total annihilation of the Celtic population of the area, and thus discontinuity in settlement patterns, but the complete absence of written sources from the Celtic communities living in the area before the coming of Rome certainly create some bias in our appreciation of historical events and major settlement transformations. The elaborate and well documented part 2 of the volume (“City and Territory”) presents rich and fully updated syntheses on the currently available data of a series of selected towns in the study region. They are nine in total: the coastal continuity cities of Sena Gallica (Senigallia), Fanum Fortunae (Fano) and Pisaurum (Pesaro) and the inland centres of Aesis (Jesi), Ostra (near Ostra Vetere), Suasa (near Castelleone di Suasa), Forum Sepronii (near Fossombrone) and Sentinum (near Sassoferrato). Of this second group all, apart from Aesis, are now predominantly abandoned sites. The discussion focuses on the period after 295 BC (battle of Sentinum), but not without a view on earlier human presence on and near these urbanized sites, and a look at some aspects of the early Imperial morphology of the cities, which of course incorporates important elements of the formation of the cities. These “interpretative dossiers” integrate very well the information from earlier research traditions adding results from excellent new fieldwork achieved during recent years, especially by teams from the University of Bologna in that region. Particularly for the sites of Sena Gallica, Ostra and Suasa, the harvest of new and important data collected during the last decade, and in part during the preparation of this new book, is impressive. These new reconstructions of town formations and ancient urban realities, often challenge and correct widely accepted views and mapping efforts of the past by influential scholars, such as of the Bologna based precursor Nereo Alfieri. They also wisely take into account the data from settlement formation and dynamics in their respective territories. This is one of the more laudable aspects of this dissertation, as the territorial data are crucial to understand the formation phases of these towns. As these data also comprise information gathered during recent non-invasive landscape surveys (e.g. aerial photography, geophysical prospection, Lidar-analysis…) they help to (partly) deconstruct certain traditional opinions and to formulate new and challenging hypotheses, not seldom based not earlier published data. In this way the approach to early urbanism presented in this volume follows the important new avenues of study rooted in the 1990s, when it was realised in the archaeology of Italy that the systematic application of a wide range of surface survey techniques held out the promise of making a major contribution to our understanding of (mostly abandoned) urban sites. In the peninsula this was greatly activated by landmark projects such as the study of Falerii Novi and later of Portus, as well as by the general refinement of geophysical techniques and aerial photography that could be used for the fine-grained analysis required to bring out full urban layouts of lost cities. The consequence of all these developments, including the widespread use of GIS in archaeology, increasingly contributed to the collection of much more significant data about the extent, the internal organisation and even the chronology of the towns. As has been shown in other parts of Marche (e.g. on the four cities of the Potenza valley) this can now also lead to investigating a much fuller range of urban sites available, such as this volume on the ager Gallicus attempts to do. Of course there remain essential questions to be answered about the early phases and specific chronology of the town formations - such as whether the indigenous (Celtic) population was really fully annihilated in this region and that the Roman towns did not in any way continue to occupy certain already existing pre-Roman centres – but the fusion of such novel non-invasive approaches with a re-appreciation of legacy data and new focused stratigraphic fieldwork certainly holds the promise of a more in-depth new study of Roman urbanism . In the concluding part 3 certain of the most important advances in our knowledge about the formation of urban centres in the ager Gallicus are well synthesised by the author. In this part a short discussion of the phenomenon of “Romanization” and cultural change in the region is also inserted. This might have been accompanied by some more daring hypotheses on demographic evolution and population numbers in the region during the chosen time period, even if both topics are less central in the prevailing Italian research tradition and should maybe be matter for future work. This applies also to a more challenging confrontation of the data with certain well-accepted theories from geographical studies, such as “central place theory”, which are of some relevance for regional studies on the reasons for the development, and eventual abortion, of town centres. Very well listed and discussed, however, are the principal factors which stimulated the genesis of urban centres in the ager Gallicus, a model which can be of great use when applied and tested in other regions of the Roman world. Also for this reason the excellent multi-disciplinary study by Silani, which fully re-activates urbanism studies in this part of Italy, needs to receive all the attention it merits.